Note: Originally published in the March 2017 issue of the Czech SF/F magazine XB-1. 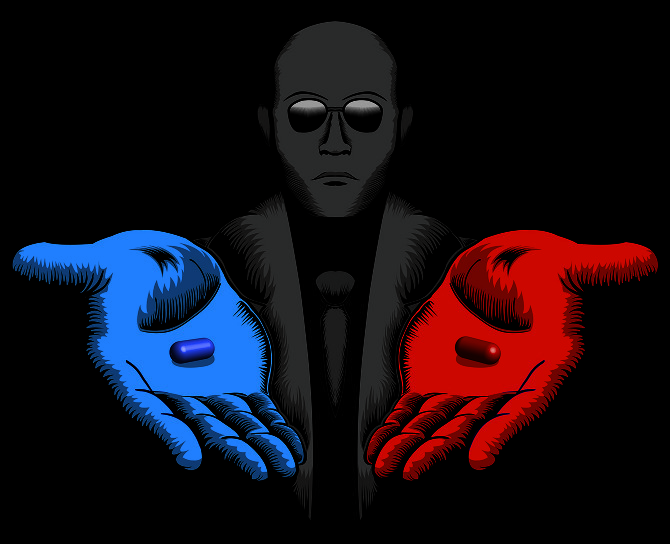 Few science fiction symbols are as powerful as red and blue pills. In the 1999 film The Matrix, the main character Neo is offered a choice of two pills to take. If he takes the red pill, the truth of an extremely painful reality will be revealed. If Neo takes the blue pill, he’ll return to his happy illusion of life. Since the release of The Matrix various political groups have seized on red and blue bills as a symbol describing people who have “woken” to their different belief systems. Among the many political groups using red and blue pills to describe what happens when someone understands and accepts their beliefs are anarchists, various progressive causes, environmentalists, the men’s rights movement, conservatives, neo-nazis, white supremacists, and many more. Obviously all of these groups don’t possess the truth of reality, and some such as neo-nazis and white supremacists are so far from the truth that they wouldn’t recognize a red pill if it was shoved down their collective throats. Despite this, I find it fascinating and disturbing that the red/blue pill symbol is seen as a metaphor for understanding the truth of reality. After all, The Matrix uses these pills in an extremely destructive manner. In the film once someone takes the red pill they are physically removed from the dream-like world the machines craft to keep humanity enslaved. Despite being freed Neo and the other red pill people frequently return to the machine-crafted illusion most of humanity lives under, wanting to free their fellow humans from endless slavery. But to do this, Neo and his followers do almost as much harm as the machines they’re fighting. In The Matrix, this “us or them” belief means Neo and his band of followers slaughter any enslaved human who stands in their way, secure in the knowledge that theirs is the path of righteousness and that, in the end, they’ll reveal the truth to the world. And it’s this human determination to reach for common ground which makes me stay optimistic about the future. Because I believe in people. I believe most people try to do good and try build a better world. This truth holds true in any successful community, be it a large, diverse community like the United States of America or a small community like SF film fans. Our communities exist even when people disagree on issues. Our communities exist because we are more alike than different. Our communities exist because so many people make a decision to reject a red pill “us or them” view of the world. And that’s one reality the red pill will never reveal to anyone who believes in a “us or them” world.